Illustrating once again that the hybrid code fills a bigger niche than just at elite AFL v GAA level, in the first half of October, an under-23 representative squad from the 4 "traditional" Australian football states (members of the Australian Amateur Football Council), toured Ireland to play 4 International Rules matches against some prominent local Irish GAA clubs. This tour follows on from a similar tour in 2005 as reported on WFN. Also planned was a match against an All-star side from the Irish Aussie Rules leagues, but sadly that did not go ahead. The following is a summary of the AAFC tour. The first match was played in County Cork against a local club Bishopstown, not far from the Blarney castle where the Aussies went to kiss the Blarney stone earlier in the day. 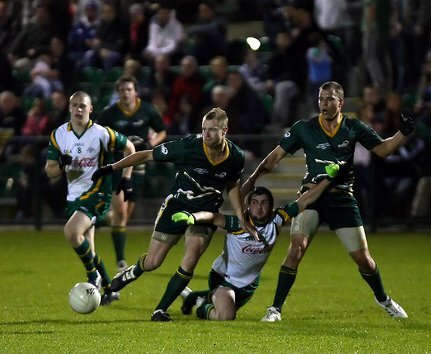 In a game described as “played at amazing pace and standard” in front of a sizeable crowd in perfect conditions under lights, scores were level early in the third term but Australia’s greater fitness seemed to be the deciding factor as they pulled away from a gallant Irish club side for a 10 point victory. The second match of the tour was played in Galway in Ireland’s west against a local university side. The pitch was waterlogged to the extent behind posts could not be erected and thus played with only classic GAA goals (unders and overs). Half-time saw the match evenly poised at 2-6 to 1-5 with Australia having made better use of the wind in difficult conditions. Once again fitness seemed the deciding factor in a second half that the AAFC u23 team dominated. The tourists then crossed east to Ashbourne, just north of Dublin in County Meath to take on a strong local GAA club, and club champions of Meath, Donaghmore-Ashbourne. As in the official AAFC report: “A new stadium, perfect pitch, and crowd around 2,500 warmly welcomed the AAFC side”. The locals had learnt of the strength of this AAFC u23 team and took no chances, stacking the county club champions with 3 Gaelic players who represented Ireland against the AFL side in International Rules including Irish and Meath legend Graham Gerrity and 3 other County Meath stars. The AAFC lads knew it was no walk in the park when Gerrity had 2 overs on the board by the 4 minute mark. The Aussies moved down to Dublin itself and by this stage had melded as a team on and off the field and were very familiar with the rules and playing style of the hybrid code. The Dublin university lads took some time to adjust that this was not pure Gaelic football and were 15 to 1 in arrears at quarter time in wet, windy conditions. Dublin City Uni came out strongly in the second quarter and at half time it was 1-5-7 (28) to 1-1-4 (13). They could never quite make up the gap despite a strong last quarter from DCU when they found the net 3 times. Hopefully this year’s GAA v AFL Test series can capture the spirit and success and great play of this third tier (given that if Collingwood ever do play Dublin that would rank as “second tier”) level of International Rules football. "Once again I would like to thank you for the huge part you played in what can only be described as a wonderful night for the club. There has been a lot of very positive feedback from all around the county on both the match and the spirit in which the match was played. It certainly restored my faith in the game itself as a concept....physical, fast, loads of action and great spectator participation. It was a pleasure to meet all you guys and compare ideas about the game... I think we could certainly learn a lot from you and hopefully we can bounce a couple of ideas against each other" and "I would also like to thank you for the rules football... my lads were out playing with it last night... I hope you all get home safely". Whilst the Irish hosts embraced this tour of the Australian under23 amateurs and appreciated the spirit, skill and competitiveness of the International Rules football played; it is interesting that the AAFC were unable to find a pitch to take on ARFLI in a game of Australian Football. Ostensibly this was due to poor pitch conditions and weather, but it may be that local GAA clubs are wary of the encroachment of Aussie Rules itself into Ireland in terms of taking players for AFL draft and away from Gaelic football in general. This tour again illustrates that the hybrid code has a place at various levels of football between Gaelic and Aussie Rules teams (and occasionally clubs of other codes), not just for the elite players of the GAA and AFL, as stories on WFN’s International Rules pages have indicated – clubs across most continents have played it, Women’s games and Masters' games also have been played at international level. On that note the kit/guernsey of the Irish Masters International Rules team is in dispute with GAA HQ at Croke Park over not being allowed to wear the official Irish IR and somewhat inexplicably the GAA seems not to be financially backing the old fellas in the upcoming Master’s series against Australia.